This image provided by Armstrong Air and Space Museum shows a lunar module replica at Armstrong Air and Space Museum. 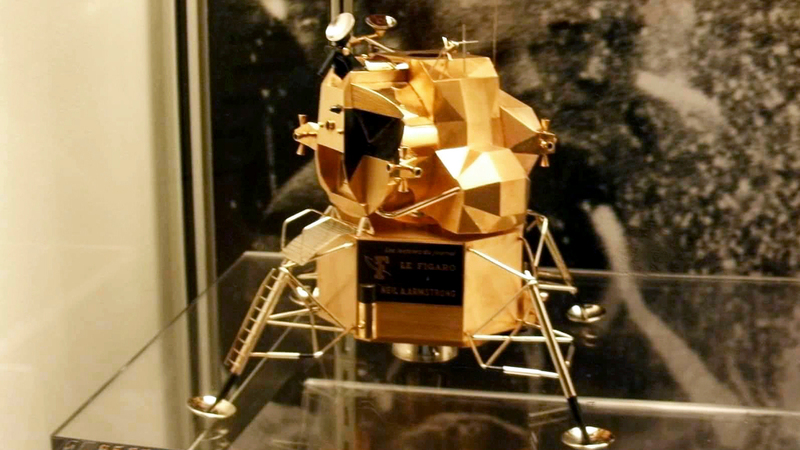 WAPAKONETA, Ohio -- Ohio police say a rare gold replica of the lunar space module has been stolen from the Armstrong Air and Space Museum. Police in Wapakoneta responded to a museum alarm late Friday night and discovered the 5-inch (12.7-centimeter) high, solid-gold replica had been stolen. Replicas of the lunar excursion module produced by Cartier were presented to Neil Armstrong and his two fellow astronauts, Buzz Aldrin and Michael Collins, in Paris shortly after their historic space mission. Armstrong, a Wapakoneta native, became the first person to step onto the moon's surface in 1969.